One carrier is outclassing its peers in J.D. Power’s latest customer-satisfaction survey. T-Mobile dominated the most recent Wireless Customer Care Performance study, in which J.D. Power asked mobile customers to rate several facets of their experience with carriers. Thousands of people answered questions about the support service providers offered via website, contact center, social media and other platforms. Verizon, AT&T and Sprint – three companies well-known in the channel – trailed T-Mobile. Cricket and Consumer Cellular won the two “non-contract” carrier categories, but we focused on the “full-service” group for this gallery. You might ask, why does a consumer-oriented survey like this matter to channel partners? The truth is that the study underscores one of our biggest weaknesses as an industry: customer experience. Influential channel figures like Tiffani Bova and Verizon’s Catherine Sugarbroad have harped on the message that customer service matters more than we previously thought. And if businesses are having negative direct interactions with their carriers, channel partners can make up the difference. Scroll through the slides below to learn more about the survey’s findings. J.D. Power asked 11,531 wireless customers to consider a dozen aspects of their experience with carriers. Those aspects include phone-based customer service representatives, automated telephone systems, and website and social media searches. The study, conducted between July and December of last year, explored three carrier categories: full-service, non-contract full service and non-contract value. For the sake of relevance we observed the "full-service carriers," which are T-Mobile, Verizon, Sprint and AT&T. T-Mobile dominated this ranking for a second year. The self-styled "un-carrier" overtook Verizon and AT&T in 2018 and hasn't looked back. The battle between the three companies is usually a tight race, but T-Mobile has established a considerable gap between it and its competitors. Only T-Mobile and Verizon surpassed the carrier average. AT&T, whose approval rating has declined slowly since 2017, rounded out the podium. Sprint remains in a class of its own, and not in a good way. The study's curiously simple takeaway is that customers care more about a carrier's website quality than the carriers realize. While companies might presume their product or their personal service interactions make the biggest differences with their customers, a clunky web presence can undo all of those efforts in the eye of the consumer. Ian Greenblatt, J.D. Power managing director, said almost one-third of full-service customers seeking online help ran into a problem. One-half went to a different outlet after giving up on the website. “Simplifying and refining websites to make it easier for wireless customers to get quicker answers to their questions is one of the fastest ways to improve customer satisfaction," Greenblatt said. The growing importance of websites might be why the Deutsche Telecom subsidiary leads the pack. We've already noted that customers highly value their carrier's website as a customer-service interface, and a recent study shows a particularly internet-dependent T-Mobile customer base. YouGov's latest Plan & Track (pictured above) found that 72 percent of T-Mobile customers use the internet as their chief information source, while only 64 percent of the general public echoes that sentiment. 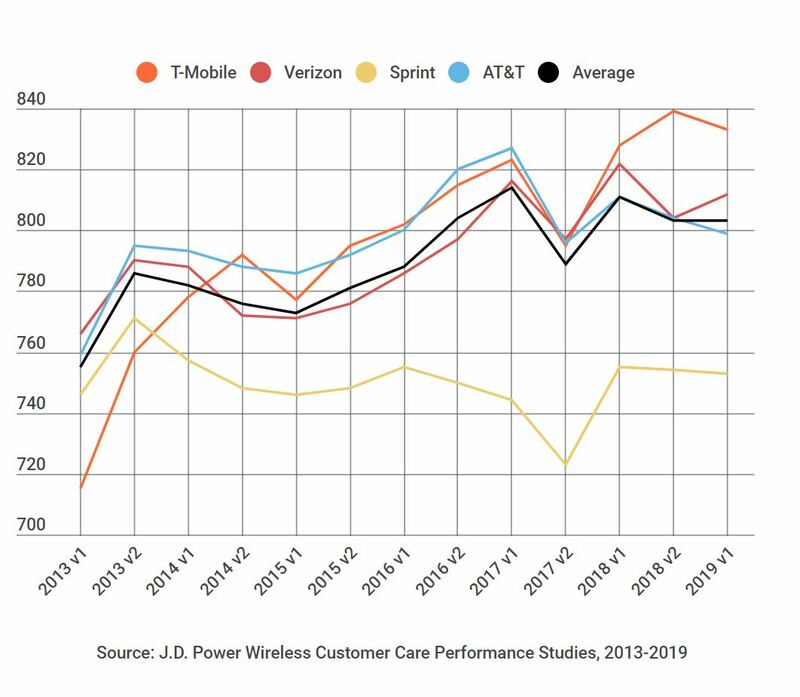 The same report shows T-Mobile overtaking its three main competitors in the last three years as Verizon ticks upward slightly, and AT&T and Sprint stand pat. A six-year chart shows that each company, with the exception of Sprint, has ultimately progressed since 2013. T-Mobile's 124-point jump from 2013 to 2018 is the biggest net change. AT&T led five times in the first nine studies but has dropped since 2017. Sprint has repeatedly fed at the bottom of this list going all the way back to 2013, and life doesn't appear to be getting better for the Kansas-based company's customers. Sprint stands to improve its products and cell coverage as a result of merging with T-Mobile, but some analysts warn that customer service might suffer again. Mike Small, chief client officer at Sitel Group, said clients might get lost in the fray as the carriers combine cultures and policies. AT&T topped this leaderboard more often than its competitors from 2013-2017, but has been hovering around an 800-score ever since. More concerning for Ma Bell is that it dropped below the carrier average (803) for the first time in several years. It's hard to tell if this is simply a matter of rivals like T-Mobile gaining market share, or a drop in performance on the part of AT&T. Verizon trailed the average carrier score from 2014-2017, but has been a step above in the last five rankings. Although it can't seem to get past T-Mobile, Verizon is besting its bitterest rival, AT&T, for now. T-Mobile has curried favor from disillusioned mobile users in recent years due in part to increased network speeds, but the company has made customer service a priority. It launched its "team of experts" last year with the goal of eliminating "the hated phone menu and call center runaround." But Michael Fimin of Netwrix told Forbes that the company might suffer from its potential acquisition of Sprint. "When T-Mobile was a smaller company, it had to offer attractive pricing for customers to compete with other telecom giants," Fimin said. "Now that it's gotten bigger and became a giant in its own right, I expect less attention to customer needs and more attention to financial results for better stock performance."